So as I've mentioned multiple times, my school is awesome - I love the students, my co-teachers are helpful (most of the time) and my administration adores me. Last week I had the privilege to accompany the second grade students on their annual trip to Jeju-do, also known as the "Island of the Gods" and a popular tourist destination for Koreans and foreigners alike. Many teachers told me it wouldn't be fun because I was touring with the students and wouldn't be able to see what I wanted on the island - okay fair enough, but let's consider the following: 1) I wouldn't have to come to school or teach for those four days 2) I'm going to Jeju (regardless of what I see the islands beautiful) 3) I get time to bond with the 2nd graders outside of the classroom and 4) Did I mention the principal wasn't making me pay? - um yeah i'm not complaining. If you're an avid reader (thank you) then you know I also hate packing - I don't care if it's for one night or one month, I hate it. So Monday morning came and I found myself throwing the last of my necessities into a bag before rushing out the door to meet everyone and board the bus. In my hurry I failed to include my beautiful new bright yellow jacket in my bag - something I didn't hear the end of for the duration of the trip. I got to school around 7:50 but was told that I was late for our 8am departure, I guess they wanted me there 10 minutes earlier to stand around and watch everyone pack onto the buses... before long we were on our way, but not without one more surprise. 류현정 my prior co-teacher and 2-1 homeroom teacher would not be joining us due to the fact she just found out she's pregnant, instead I would be accompanied by 임동향 the Chinese characters teacher but eager English student, who loves talking with me :) Also on my bus was the principal, who also loves talking with me but usually only after a few [bottles] of soju. Class 2-1 is full of some allstar students so I knew this was gong to be a good trip, despite the 4 hour bus followed by a 2 hour ferry. Let's just say we found ways to entertain ourselves, one of which being the noraebus (noraebang meets bus, yes you're reading this correctly) and yes I was persuaded to sing - "Moves like Jagger" is now my principal's new ringtone he enjoyed it so much. Thankfully we had an hour long rest stop for lunch and some sightseeing at 낙안읍성, a folk village in the Jeollanam province. The students were all instructed to pack a lunch, which from what I saw consisted of kimbap, chip and other loads of junk food. Meanwhile the teachers jetted over to a nearby restaurant for some soup, and lots of 반찬 [side dishes] none of which wowed me but food is food. After we met back up with the students for lots of picture taking - I was slowly learning who my new 2nd grade admirers are. Our school pretty much took over the ferry, I sincerely feel sorry for anyone else aboard. Even with the privilege of sitting upstairs in business with the rest of the teachers I couldn't' avoid hearing the kids below. First the excitement of being on the ship, followed by a Dunkin Donuts sugar high, easing into the ooh's and aah's coinciding with the rocking of the ship and finally ending in some silence as many of them experienced 멀미 (seasickness). It may have been due to the fact that there were 250 energetic students on board but the staff of the ferry decided to allow all passengers outside for the first 15 minutes of the ride - of course most of the students (and myself) took full advantage of this, cameras in hand. 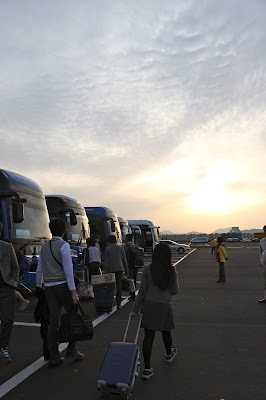 Reaching Jeju as the sun set on the horizon was a beautiful welcoming before jumping aboard yet another bus this time en route to our hotel. Safe to say by the time we got there everyone was tired and hungry, neither of which were effectively taken care of. Dinner was a let down (but what do you expect when you're trying to feed 250 people at one time) honestly though I think our school lunches are far superior to the cafeteria food at this resort. And sleeping - well let's just say I forgot i'm not in high school anymore (as much as I sometimes like to think I am) and value my 8 hours of sleep, I quickly realized that was not going to happen on this trip. I'll leave it at that for now - leaving you wanting more, hopefully. I can only say there are some funny stories ahead, entertaining pictures, and even some superb videos. If you keep reading you'll likely be able to tell why exactly i've decided to stay in Korea for a second year of teaching, but if you can't - well I feel sorry for you. I've often been asked "Why did you come to [choose] Korea?" which is admittedly a really difficult question to answer - there was no specific reason. However, now after living here for just over a year, I can easily answer the question of "Why did you choose to stay in Korea", and that answer is simple - my students. Love your Blog!! I'm applying to EPIK in August for Spring 2014 I hope I get in and get to work at an amazing school like yours. P.S. Love your blog just had to let you know one more time.